[Updated] Minister of Finance Curtis Dickinson is holding a press conference this afternoon [Jan 10] regarding the Economic Substance Act 2018 initiatives. We will have additional coverage later on and in the meantime the live video is below. In 2017, the European Union threatened to blacklist jurisdictions that did not meet their specifications on various matters including tax transparency and what they deem to be fair tax practices. Various jurisdictions made different commitments, and in Bermuda’s case, the island committed to “addressing the concerns relating to economic substance”, as did the Cayman Islands, Guernsey, Isle of Man, Jersey and Vanuatu. Update 4.04pm: Minister Dickinson said, “In December 1997, the Council of the European Union [EU] adopted a resolution on a Code of Conduct for business taxation with the objective of curbing harmful tax competition aimed at jurisdictions with low or zero rates of corporate income tax, such as Bermuda, BVI, Cayman and the Crown Dependencies. “I am very pleased to say that as part of our ongoing commitment to compliance, regulation and transparency, we implemented reforms and on the 17th of December 2018, the Economic Substance Act 2018 was passed by Parliament. This ensures that Bermuda remains off any EU list of non-compliant jurisdictions and will continue to thrive as an international business centre. “Bermuda registered entities including companies in the banking, insurance, fund management, financing and leasing, headquarters, shipping, intellectual property, distribution and service centers, and related holding company sectors will now need to meet economic substance requirements as provided in the legislation and related regulations. “These firms must show that they have a physical presence, personnel and revenue-generating activities in Bermuda. The economic substance requirements will apply to new companies from 1 January 2019 and existing companies from 1 July 2019. “The government proposes incentives to companies affected by the Economic Substance Act to keep them in Bermuda and encourage job creation and opportunities. “The new EU Economic Substance Incentives Programme includes the application of the already in place “New Business Work Permit Policy” as well as payroll tax relief. “The government understands that the two things foremost in the minds of most Bermudians are jobs and the protection of Bermudian opportunities within our own country. “Closed or restricted job categories such as a front office receptionist, or which are entry level, graduate or trainee positions, will remain closed and continue to be protected, giving Bermudians the opportunity to earn employment in the new jobs created by these companies. “For the many Bermudians my parliamentary colleagues and I met on the doorstep who lost positions such as these during the recession or who had graduated and been unable to gain entry into those fields, the creation of new jobs and new opportunities in the sectors that I mentioned earlier, this will be welcome news. “The government is committed to working with these companies to ensure that unemployed and underemployed Bermudians will be ready and able to fill these posts. “The New Business Work Permit allows an exempted company that is new to Bermuda to receive automatic approval of work permits for the first six months of obtaining its first new business permit. “As part of the eligibility criteria, a business must be directed and managed from Bermuda, and it must show that it has adequate personnel and expenditure undertaken on island thus creating jobs and opportunities within new or existing businesses offering support services. “The New Business Work Permit policy has been in place since 2012 and will include exempted companies already registered in Bermuda without employees and any new exempted company that decides to set-up in Bermuda with employees. “Businesses that will need more than ten work permits within the first six months of operation [e.g. relocating an existing business from another jurisdiction] will be required to present to the Minister their Bermuda office staffing plan including their projections for hiring and developing Bermudians as well as engaging local service providers to support their organizations. “To further encourage job creation, in May of last year the government granted medium and large companies an incentive that is a 3 year employer Payroll Tax concession for additional jobs created in Bermuda. With respect to this programme, the concession will last for two years and extend to companies that create or transfer jobs to Bermuda. “The Government’s plan encourages and rewards investment in Bermuda’s economy, encourages businesses already here to expand and stay, and our tax incentives will encourage job creation. Simply put, our goal is to have more companies and more jobs based in Bermuda, providing more employment and entrepreneurial opportunities for Bermudians. 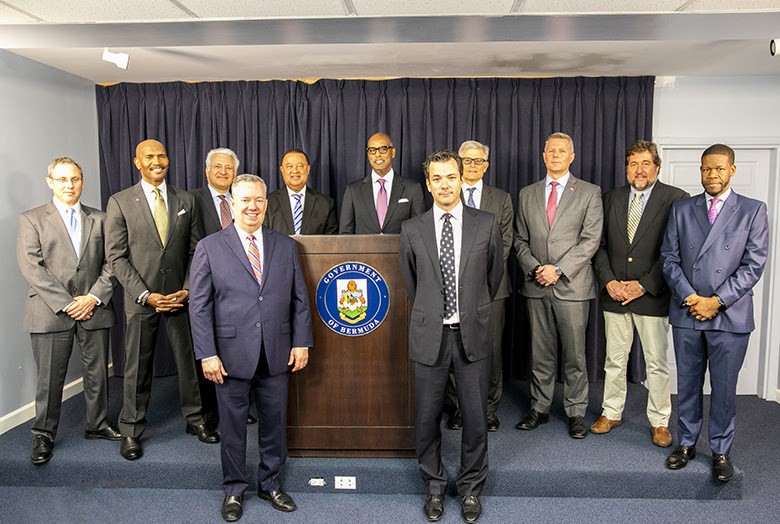 “In implementing these reforms and drafting this legislation, I am grateful for the support of the Bermuda Government Technical Officers, the BMA, the IAC, ABIC and ABIR, and all sectors of Bermuda’s international business community. Kempe: What Is Govt’s Plan For EU Substance? And the contingent supporting him clearly endorse him and his message. What will Kempe and Cannonier try to say next to sully the situation? Perhaps they will praise the minister for using legislation dating back to 2012 that was introduced under an oba government? Umm the OBA wasn’t the government until dec 2012, I highly doubt they introduced any legislation between Dec 18 and Dec 31. You better read up on the comments made by several PLP MPs when the New Business Work Permit policy was introduced by the OBA. The message is pretty much the same as the OBA as Bermuda inviting more people to come to Bermuda to live and work. I suppose it just depends on who is delivering the message? Nevertheless, it is refreshing to hear a PLP Minister being so welcoming to foreigners. If this was the OBA who came out and said we are going to give these foreign firms payroll tax relief and automatically approved work permits the posts below and above would be screaming ‘anti-Bermudian’ and yada, yada, yada. Amazing how the responses change when it is their preferred messenger. And also very sad how they can’t see their own rank hypocrisy. It’s a big difference because OBA only did things to line their own pockets!!! Now we seek to line the people’s pockets!! Get a ticket – it’s a good train! And of course, it’s lost on the base. More people, more foreigners is good. Next: Pathways to Status. Wonder how they’ll reframe that? Continuing on with OBA business friendly policies is now all of a sudden a good thing for Bermudians that deserves praise. Incredible what and election can do to one’s view on certain subjects. But as you said it is good to see the PLP going against their anti-business and xenophobic rhetoric. Guessing reality finally sunk in that their previous intolerant approaches would do nothing for Bermuda. Trying to get hold of other legislation by affected countries … really, how hard is that? Not telling us what Govt research says?! …. no plan B if the EU rejects the legislation … no immediate plan … no metrics on judging what substance is .. wow …. Maybe the EU hasn’t set out the criteria for satisfying economic substance. Insread of throwing shade you might consider asking questions – perhaps! Seems those meetings aren’t so private and the same old OBA supporters are running back to the OBA. If the OBA knew that the Minsiter was consulting with IB why did they issue a statement. They could have waited, but little Nick Kempe couldn’t help himself, and just had to say something. Then JetGate comes after him to say, we know what he’s been saying in private. If he announced b4 consultation the minister would have been attacked for not consulting. PLP, thank you for recognising that there are Bermudians who can fill these jobs, unlike the OBA who want to open up the floodgates while Bermudians suffer! PLP keep up the good work and ignore the OBA haters that are everywhere – even in your meetings pricking to the OBA. Guessing you didn’t read about automatic work permit approvals, huh? The only jobs guaranteed are the already low level positions that are already closed categories to non-Bermudians. As I said above if the OBA did the same press release you would be screaming about how they are giving away this island to all these foreigners. We need overseas people to up our coffers dummy! We can’t grow more Bermudians in a short time period! Pay attention! Are you stupid or just daft? Rhetorical question, thus no need to answer. The policies the PLP is using for this initiative are the ones that they criticised as being anti-Bermudian and the like. And supporters such as yourself jumped up and down and repeated the lie. Now the PLP is using them you now praise them as being pro-Bermudian. The OBA noted many times the need to bring in extra people and you and your crew jumped and down and cried anti-Bermudian or illegally shut down our duly elected Parliament due to your ingrained hatred of foreigners or anybody that differs really. And now you are saying we need foreigners!! Like I said you lot are nothing but a bunch of rank hypocrites. So it seems like you are the one that needs to pay attention, sheep. It doesn’t matter how much you repeat the lie, it doesn’t make it true. Even the most ardent critic would have to agree this is a masterful touch. An excellent mix of Bermuda’s business leaders sends a powerful message locally and to our overseas competitors. No. It’s common sense. And it just shows how morally and intellectually bereft the PLP has been if a dose of common sense is seen as masterful. There’s no way for example, old Flip Flop standing right there could have come up with this. So if it’s common sense, then why all of the vitriol and negative comments from your OBA Zombie friends? With their lame attempt to act as though the Goal post have not just shifted to the other side of the field. So let’s just flip your “intellectually bereft” comment back at you and your sheeple. Hold on, this is good. What I’m pointing out, is the rank hypocrisy of the PLP and their supporters. If the OBA had introduced something of this nature, there would be marches on Parliament. To suggest a “masterful touch” is stupid, particularly as it’s reframed and regurgitated OBA idea. But don’t let facts get in the way. Finally, there’s a moderately competent Finance Minister wearing a green tie. Let’s see how much influence he has within cabinet. Maybe the masterful touch was referencing oba policy introduced in 2012? You’re a good puppy for recognizing the legislation that the OBA drew up as being a good thing. Lucky they did, as the PLP doesn’t have the intelligence to do anything good for Bermuda. You see all of that influence and support behind him. Those are big names up there. I dont recall seeing anyone from either party having support like that at any press conference in recent years. That alone shows he is respected, and connected to the business world. Like he said hes been in important positions before(wallstreet) so while new to the political realm he certainly isnt a rookie in the business world. likely the members of the advisory group that volunteered to assist with practical applications pertaining to the act and assisiting with review of the drafts. Example of the private and public sectors working together for the good of Bermuda. Its a reach to speculate that this is a show of force or support for the government–that’s making this political and its not. Yep. Finally the PLP are adopting sensible policies like the OBA had. That’s why this gets support. They finally have no choice but to be reasonable, like the OBA were. They finally have no choice but to be reasonable, like the OBA were. LOL – So reasonable that they were voted out of Gov’t… Got it! And now the PLP are implementing OBA policy. LOL, it proves how gullible and glassy eyed the plp and it’s drones really are. Will the Government also give payroll tax relief to local businesses? Well done PLP and the support from IB is appreciated. So tax breaks and automatic work permit approvals for foreigners and foreign business is a good thing now? What changed from 2017 till now? Being pro Bermudian and setting up policy that protect the Bermudian people in the work place has only made you Bermudians Haters beleive that it meant Bermudians and the PLP Gov’t hate the Foreign worker!! You OBA zombies are as disingenuous as they come…. You asked what changed from now? The EU SUBSTANCE ACT! The game changing rule that YOUR clueless OBA Gov’t did not have to deal with…. If setting up a Physical Presence in the country is now REQUIRED then I would expect any sensible Gov’t to make it as easy as possible to do so, but I am confident that this Gov’t will still look for opportunities for Bermudians in this process, a confidence I did not have with the OBA..
LOL, I’ve got a bridge to sell you….you gullible racist. Allowing and encouraging immigration has always been a desirable thing. It is good for us, good for our economy, and good for Bermuda. The problem is that you lot always characterized immigration as ‘being anti-Bermudian’, Which, frankly, is and always was a, an extremely stupid way to look at it. Now that they’re adopting OBA policies you applaud them. Finally some common sense is sinking in. You do realize the work permit policy that you are applauding were introduced by the ‘anti-Bermudian’ OBA right? Does that make the PLP anti-Bermudian now, or is it different somehow, someway? You see those highly-capable business leaders standing there in the photo? They are sweating bullets. Why? Because the EU requirements will result in a very significant diminished book of Bermuda registered businesses. They are collectively praying that some organizations will actually elect to create a Bermuda presence. Because if that doesn’t happen, we’ll, you know. The OBA would never have achieved this as they would only be focused on how they would make money for themselves! That’s why they got kicked out for holding a boat race for their mates and ace boys when we needed trash tucks and buses! If they wanted to Range Rover would have donated them!